The Cowlitz Falls Project is a 70 megawatt hydroelectric dam that was constructed in the early 1990’s. The dam and power generation facility were completed in 1994. The dam is 140 feet high and spans approximately 700 feet across the Cowlitz River. The reservoir behind the dam has a surface area of approximately 700 acres. The Cowlitz Falls Project is built in a narrow constricted portion of the Cowlitz River immediately upstream from Tacoma Power’s Riffe Reservoir in eastern Lewis County. Situated a short distance below the confluence with the Cispus River, the dam operates in a “run-of-the-river” mode, using water from the Cowlitz and Cispus Rivers. The Cowlitz Falls Project produces on average 260,000 megawatthours (Mwhrs) annually or approximately one-third (1/3) of our annual needs. 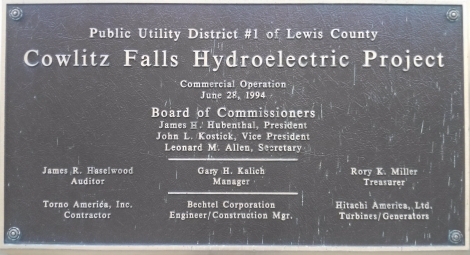 Lewis County PUD and the Bonneville Power Administration (BPA) cooperatively developed the Cowlitz Falls Project. While we are the owner of the Project, BPA has purchased the annual output of the Project under a long-term contract. In exchange for receiving the output of the Project, BPA pays all costs associated with its operation and maintenance. Lewis County PUD buys its power from BPA so the power generated by the Cowlitz Falls Project helps supply the needs of Lewis County residents and businesses. In addition, a new substation in Glenoma and transmission lines to serve the Project were built to improve service reliability to eastern Lewis County. As part of the federal license to construct the Cowlitz Falls Project, we have provided a variety of environmental and mitigation programs. Additional lands were purchased by the PUD for reservoir buffer zone vegetation and wildlife management. Trees have been altered for eagles and ospreys to nest and perch, and plantings made for deer and elk. We annually stock trout in the reservoir (Lake Scanewa) for sport fishing. BPA, in cooperation with Lewis County PUD, state and federal agencies and Tacoma Power, have constructed a downstream anadromous fish collection facility at the Cowlitz Falls Dam. The fish facility has permitted the reintroduction of salmon and steelhead in the upper Cowlitz River basin. The upper Cowlitz and Cispus River basins were blocked from migrating salmon and steelhead by Tacoma Power’s construction of the Mossyrock and Mayfield Dams in the 1960’s. Lewis County PUD, BPA, and Tacoma Power are involved in efforts to improve the anadromous fish reintroduction program for the upper Cowlitz River.